In this April 30, 2017 file photo, Dr. John performs at the New Orleans Jazz and Heritage Festival in New Orleans. The New Orleans-born musician celebrated his 77th birthday last Nov. 21 in the French Quarter. But he was apparently a year early. Publicist Karen Beninato said she looked into it after talking to friends and relatives of the Rock & Roll Hall of Famer. 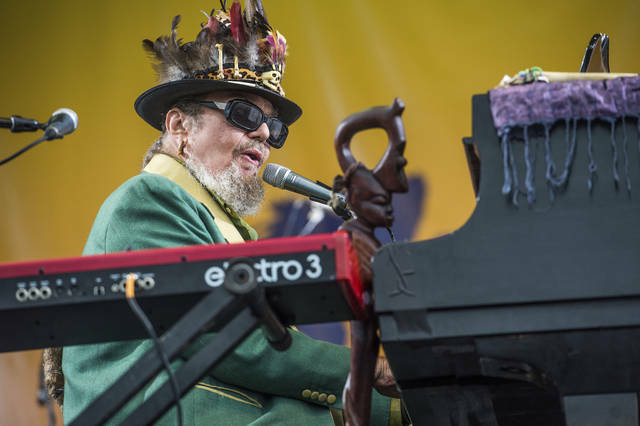 NEW ORLEANS (AP) — Turns out it really was the “Right Place, Wrong Time” for Dr. John. The New Orleans-born musician, whose discography includes that 1973 hit, celebrated his 78th birthday Wednesday. But he was apparently a year early. Publicist Karen Beninato said she looked into it after talking to friends and relatives of the Rock & Roll Hall of Famer. Music writer John Wirt, at Nola.comThe Times-Picayune , found a 1941 newspaper birth announcement for the musician, whose real name is Malcolm John Rebennack. And it’s not just the year: The local musicians union confirms the correct day in its records is Nov. 20 — not Nov. 21. Beninato said Rebennack began adding a year to his age so he could play in New Orleans clubs as a teen in the 1950s. “Mac has rolled with it since his teenage years,” she said in an email. The 1940 date has lingered due, in part, to Rebennack himself. Wirt cites the musician’s own memoir, “Under a Hoodoo Moon,” as saying he was born just before Thanksgiving 1940. The incorrect date is in countless published stories, biographies and interviews. Rebennack himself has been cagey about the birth date. “He keeps his mysteries,” Beninato said. He canceled some gigs last December and has been resting at his New Orleans area home since then, making no public appearances. In an interview, Beninato said Rebennack had a traditional New Orleans response when she told him he wouldn’t have to do a press event to mark this year’s correct 77th birthday because he’d already done it last year. “He said, ‘Yeah — you-right,’” she recalled. https://www.portsmouth-dailytimes.com/wp-content/uploads/sites/28/2018/11/web1_121823182-961e69890a5e4973b2fa7aaac8d68c27.jpgIn this April 30, 2017 file photo, Dr. John performs at the New Orleans Jazz and Heritage Festival in New Orleans. The New Orleans-born musician celebrated his 77th birthday last Nov. 21 in the French Quarter. But he was apparently a year early. Publicist Karen Beninato said she looked into it after talking to friends and relatives of the Rock & Roll Hall of Famer.